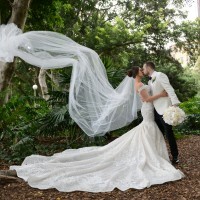 A custom made designer Suzanna Blazevic wedding dress. This dress has been dry cleaned and is in excellent condition. It has only been worn once. The classic white veil is also included. The colour is soft oyster, Suzanna's signature colour. This colour helps emphasise the embroidery. Three different types of contour lace were woven together to create the great detail throughout the dress. The beading also creates a divine shimmer. I am 167cm tall and wore 7cm heels. The veil and shipping are also included in the price. Please contact me to discuss further, the price is negotiable. Once you send a message, Vesna can invite you to purchase the dress.